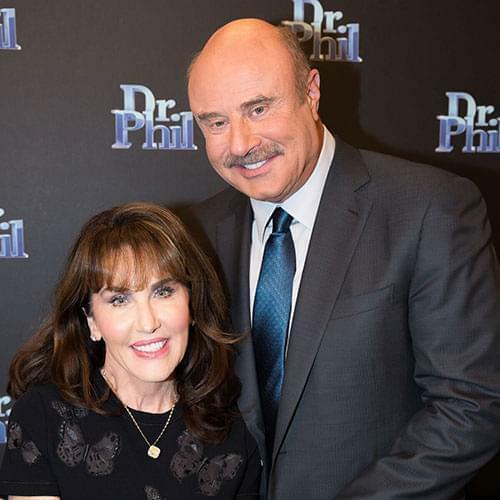 Dr. Phil and Robin want to celebrate a very special woman who chooses to live her life with passion and purpose. Lesia Cartelli has devoted her life to helping young burn victims because she knows their pain firsthand. Her organization, Angel Faces, is an innovative healing retreat for teenage girls with facial or body differences due to burn injury, cancer, accident, abuse or birth abnormalities. Angel Faces is the only program in the United States that focuses on the specific concerns of adolescent girls with disfigurements, and enhancing their self-esteem and social skills while addressing their emotional and psychological healing. Angel Faces is in its third year, and because of the budget, Lesia has only been able to host one retreat a year. Her vision is to increase the retreat’s staff and resources to have at least three of them yearly. “My goal for Angel Faces, I would like to see this made available to the girls throughout the country. The need is there to grow the program. We need the funding to grow Angel Faces. When I go home, and I go through my books and my papers, I’ll find notes from the girls.” She reads one of them. “â€˜Lesia, thank you very much for everything you do. If we did not have you in our lives, we would not know what to do. You have touched all of our lives in many ways that’ll help us in the future.’ When I see stuff like this, I know I’m on the right path,” Lesia says. 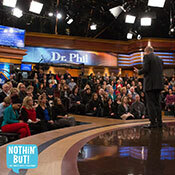 Dr. Phil introduces Lesia Cartelli. “So tell us how this experience has been for you in touching these young girls’ lives. I mean, that’s got to be so wonderful to do,” he says. “When they arrive, they are so wounded, and you can see that social armor on them. Their heads are down and their shoulders are closed, and from that transition to the end of that week, it’s extraordinary,” Lesia says. “This has been very near and dear in my family, particularly to Robin,” Dr. Phil says. Robin explains, “Very near and dear because my sister, Cindi, was burned over 75 percent of her body five years ago. Somebody threw acid off of an overpass and into her car and all over her, and she has endured more pain and more agony, but has handled it with such grace.” Robin begins to tear up. “Yes, it’s very dear to me that you would reach out to help other burn victims. It just touched my heart and I thank you so much,” she says. 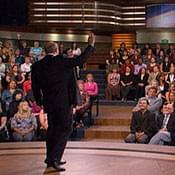 Dr. Phil explains that through Robin’s book, Inside My Heart, they have created an award called the Heart of a Woman. Robin tells Lesia, “I think you are a perfect example of someone who has used your tragedy and your life to touch others, and that’s why I believe you deserve the Heart of a Woman Award.” Robin hands her a framed award, and then holds up a beautiful diamond necklace. “Tacori jewelers and I created this diamond heart necklace to signify what a woman’s heart can choose to do,” she says, handing the necklace to Lesia. One of the girls touched by Lesia’s organization makes a surprise appearance on stage. Crystal greets Lesia with a big hug. “So, you think we’ve made a good choice with the Heart of a Woman Award?” Dr. Phil asks Crystal.